I’ve had all sorts of thoughts rattling around in my head since I first saw Rogue One: A Star Wars Story. I gave it an A in my review, and I stand by that, especially as a reflection of how I feel about the film having now seen it twice. On the other hand, I don’t think Rogue One is necessarily that great of a movie either. It has some major character development issues that are for me its biggest shortcoming, particularly when held up to The Force Awakens whose greatest assets was its characters. 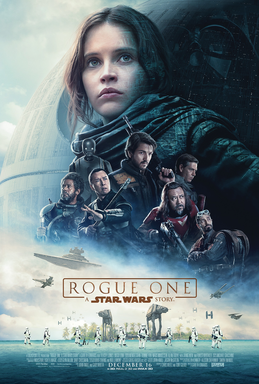 So I wanted a chance to talk about the things I love about Rogue One, the things that frustrate me about it, and any other observations I might have. (I did something similar for The Force Awakens.) Needless to say there will be Spoilers Below for anyone who hasn’t seen the film. Here, in no particular order, are some Rogue One thoughts and opinions that continue to clog up my brain. And of course, keep in mind that all of this is coming from someone who unashamedly loves the prequels. I’ll be honest, since Rogue One: A Star Wars Story was first officially announced a little over a year ago it became my most anticipated Star Wars movies, far more than The Force Awakens. As much as I enjoyed that film, Rogue One was always easier for me to get excited about. I love the idea of exploring the vast Star Wars universe without having to be tied into the story of the Skywalker family (in the way many of the books did), and with the departure of George Lucas I was less worried about whether or not Rogue One is the “true” version of the story. Canon has always been important to me, so the fact is that I’ll never be as attached the main series of new films the way others might be, no matter how much I enjoy them. But I am 100% behind Rogue One, whose first trailer debuted this morning and which promises a very different take on Star Wars than we’ve ever seen before. Take a look at the trailer below and tell me what you think, and then check back later in the week for a more in-depth analysis complete with screencaps (I keep wracking up more articles to write, don’t I?). As for my first thoughts, it’s definitely thrilling, and I love how it’s going out of its way to give us a different view of events with which we’re somewhat familiar. It’s trying very hard to differentiate itself from the main series of films, which is definitely a good thing. Plus I’m already rooting for Felicity Jones’ character, Jyn Erso, and more strong female protagonists can only be a good thing!